Ten years ago Freedom Alliance hosted its very first Military Leadership Academy (MLA) class, a summer camp that provides high school students an opportunity to experience the military lifestyle while learning valuable leadership skills. “Back then, the MLA was a one or two day program that took place all over the country at different military bases,” explained Academy Director Tim Stickler. “It was great because it was kind of a summer camp that got kids involved to better understand what the military is like at these different bases, since then we have made some huge strides in providing students even more military experience,” said Strickler. 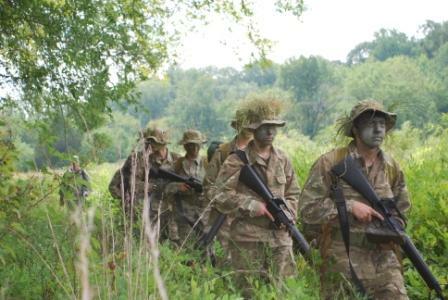 Over the years the MLA has transformed from a two day summer camp into a two week military training program based at Fort Pickett, a National Guard Post in Blackstone, Virginia. “Now cadets live on a military base, tanks are rolling by, soldiers are walking around, and the kids are training right next to these guys, sometimes hand in hand with service members. I don’t think there is any other program that has that in depth, gritty experience,” said Strickler. Interest in the camp has skyrocketed over the past two years. Last year was the MLA’s first year with a full enrollment, fifty cadets each session, and a waiting list. This year the MLA anticipates full enrollment as well. Cadets will participate in a program based on the curriculum of the U.S. Army. Physical training, tours of military bases, leadership simulations, land navigation, field tactics, urban warfare training, and a visit to Washington, DC. Instructors are exclusively ROTC cadets, or midshipmen. “The camaraderie and esprit de corps between the instructors and the cadets is amazing. It’s a tough experience and they bond over each challenge,” said Strickler. Freedom Alliance and the Military Leadership Academy make it a priority to remain involved in the leadership development of its alumni cadets and instructors long after the program’s conclusion. Freedom Alliance reports that every year graduates are continuing to reach personal goals and better their communities after their official training ends. “Because the people we get to work with are so motivated and mature and want to be here for the right reasons, that’s what makes the MLA so special. We are really looking forward to this summer and proud of what we have accomplished in these 10 years,” said Strickler. For more information or to apply please visit the MLA’s new website at http://www.mlacamp.com, email info@mlacamp.com or call 1-800-475-6620. Applications must be received by June 1, 2011.